The accelerator for companies with at least one female in leadership welcomes a dynamic batch of new companies. MergeLane, the investment accelerator for companies with at least one female in leadership, today announced its 2016 cohort of ten exceptional startups. MergeLane’s 2016 program is twelve weeks starting on February 1st. The accepted companies were selected through an open application process that began in the fall of 2015. MergeLane’s accelerator structure is unique, requiring the founders to be resident in Boulder, Colorado, only for the first two weeks and the last week of the program. The intervening weeks are run remotely. The cohort will receive guidance and mentorship from more than 100 innovative business leaders as well as executive coaching to address the intrinsic issues founders often face in growing their businesses. Alchemie: Ann Arbor, MI. Alchemie teaches complex, hard-to-pass science subjects like organic chemistry through mobile-enabled, game-based learning. Atlas Vault: Greenville, SC. Atlas Vault’s SaaS solution allows enterprises to ensure consistent cyber-security protection at every level of their complex supply chains. Ballot Ready: Chicago, IL. BallotReady is a mobile-enabled online voter guide designed to increase overall participation in local elections by putting high-quality information in an online platform that voters will actually use. Cabsolutely: Memphis, TN. Cabsolutely’s tech platform gives traditional taxi companies the ability to provide drivers and riders with a seamless experience on par with the leading ride-sharing companies. Cloudforest Software: Boulder, CO. Cloudforest enables building professionals to make fully informed design and construction decisions at the ideation stage of commercial projects. Globig: Boulder, CO. Globig is accelerating the internationalization objectives of expanding companies by giving them the tools, experts, and knowledge they need to enter new international markets efficiently. Hatch Marketing Plans: Boulder, CO. Hatch is a marketing planning tool that helps businesses quickly gather ideas, forecast outcomes, and demonstrate ROI across all media channels. Healthiest: San Francisco, CA. Healthiest is a content and commerce platform for alternative medicine. LittleLane: San Francisco, CA. LittleLane gives parents access to the best kids events and activities in their area and the opportunity to explore a variety of new options seamlessly with LittlePass. Startwise: San Francisco, CA. StartWise is a next-generation crowdfunding platform that enables socially responsible companies to raise capital from a new cadre of investors in exchange for revenue-sharing participation. MergeLane was founded in 2014 to narrow the gap for female-led companies in the startup ecosystem. The for-profit effort also is designed to optimize returns based on a strong investment thesis that favors female-run firms. Last year’s cohort collectively has raised over $11M in funding and created over 100 jobs. MergeLane is sponsored by Bryan Cave LLP, First Western Trust, The Museum of Boulder, The Kauffman Foundation, Galvanize, and SoftLayer. 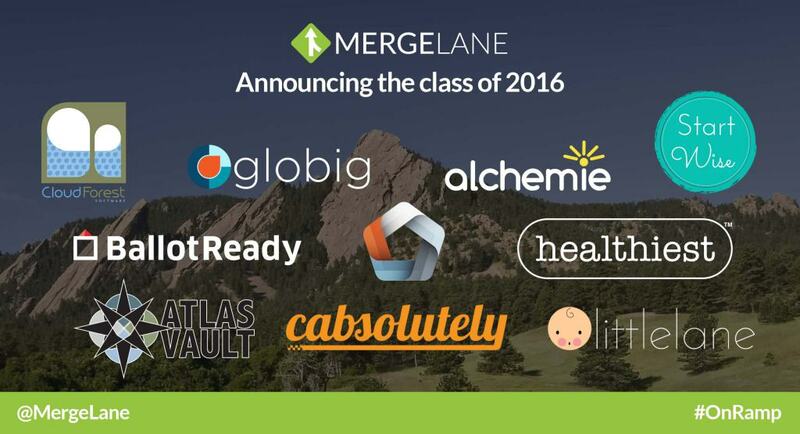 MergeLane is a Boulder-based investment accelerator and fund focused on companies with at least one female in leadership. MergeLane’s 12-week program pairs a select group of high-growth companies with industry-leading mentors and CEO coaches with the goal of dramatically increasing their growth trajectory. MergeLane is proving that investing in women isn’t just the right thing to do, but the smart thing to do. In addition to the accelerator program, MergeLane makes select investments in women-led companies outside its accelerator. MergeLane is the proud recipient of the U.S. Small Business Association’s 2015 Growth Accelerator Fund competition. For more information, visit www.mergelane.com.